The mission of Maluhia’s Food & Nutrition Services (FNS) Department is to provide quality food and nutrition services to meet the nutritional and hydration needs of our residents. Each resident’s nutritional status is reviewed by our Dietitian upon admission and throughout their stay in order to ensure that the meals provided meet the resident’s nutritional needs, food tolerances, and special dietary concerns. Our professional culinary team in Food & Nutrition Services takes pride in preparing nutritious and tasty meals to meet the resident’s specific meal plan as arranged by the Dietitian. 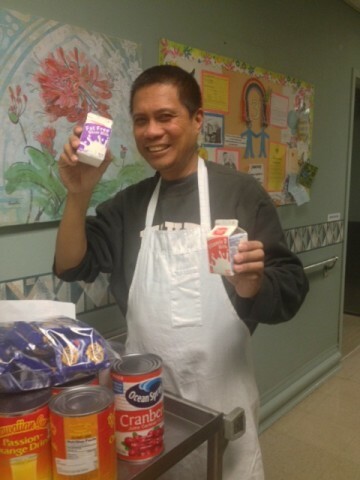 In addition to serving meals to our residents, FNS prepares meals for our Maluhia Adult Day Health Center participants, clients in our Express Meal Program (take home meals for those living in the community), visitors, staff, and special events. Maluhia’s menus include a wide variety of local ethnic foods that are enjoyed by our culturally diverse population. In order to meet the special dietary needs of our residents, the daily menu items are also prepared in modified textures (i.e. cubed, chopped, minced, and pureed), thickened liquid consistencies (i.e. nectar-thick, honey-thick, and pudding-thick), and modified for therapeutic diets (i.e. controlled carbohydrates, high calorie, low sodium, allergies, etc.). While Food and Nutrition Services provides the foods to nourish our residents, we want our residents to socialize and enjoy their meals in a homelike dining setting. Residents are encouraged to dine with other residents in our common dining rooms. Families also help to make mealtimes special by bringing in favorite foods enjoyed by their loved ones. Mealtime gatherings with friends and family on the sundeck or in one of our beautiful private family rooms help to enhance the quality of life of our residents at Maluhia.